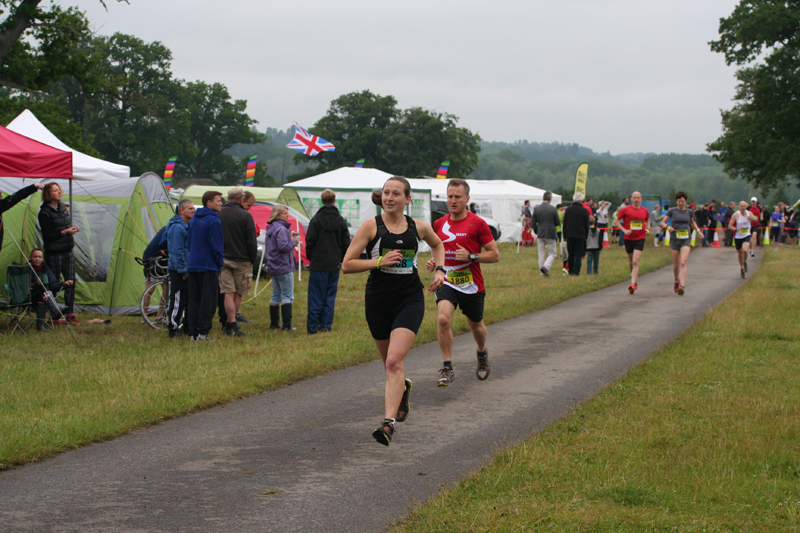 The Endure 24 is a 24 hour running event held in the grounds of Wasing Park, Aldermaston, near Reading. The event involves individuals, pairs or teams running as many 5 mile loops as they can within a 24 hour period. 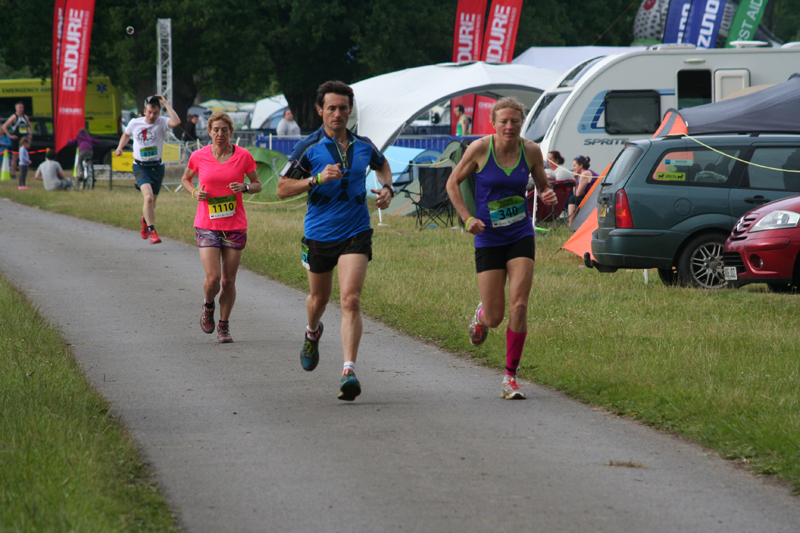 With plenty of space, it’s a festival of running with teams camping over the weekend and this seems to be a popular format with more events of this nature being created over the past few years. The Endure event is now in its 4th year and the event has grown year on year to the estimated 2,500 runners taking park this year. The event is on my doorstep and I have taken part in the event each year in different categories. This year, I was returning in a 5 person team which gives me the opportunity to introduce my team mates. Our team of five included Jim Seaton and Michael Sartorius, ultra-running Dads at my Daughters school. 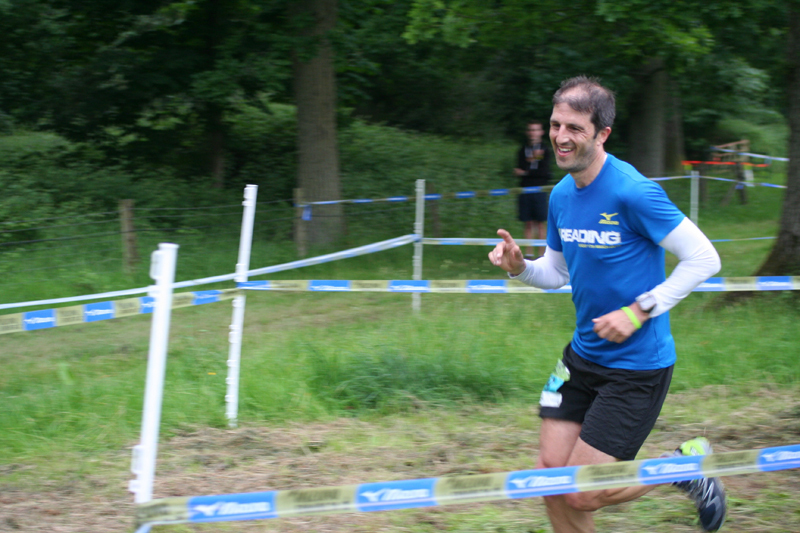 Next was fellow ultra-runner Paul Radford. Our team had been one person short last year and I put a call out to a volunteer which Jamie Woods and Paul both responded to. As Jamie responded first he joined the team but I thought it was only fair I ask Paul this year… the fact that he’s a cracking runner also helped! Finally, Amy McKechnie a work colleague based in our Halifax office was our final runner. People reading this blog won’t know Amy as she runs local races and only a handful of ultras but she is a really strong runner. After exchanging running chat for many months, it was great to finally get a chance to run together (sort of). Wendy Shaw who had run with us last year was running the South Downs Way 100 on the same weekend so the team all fell into place quite neatly. 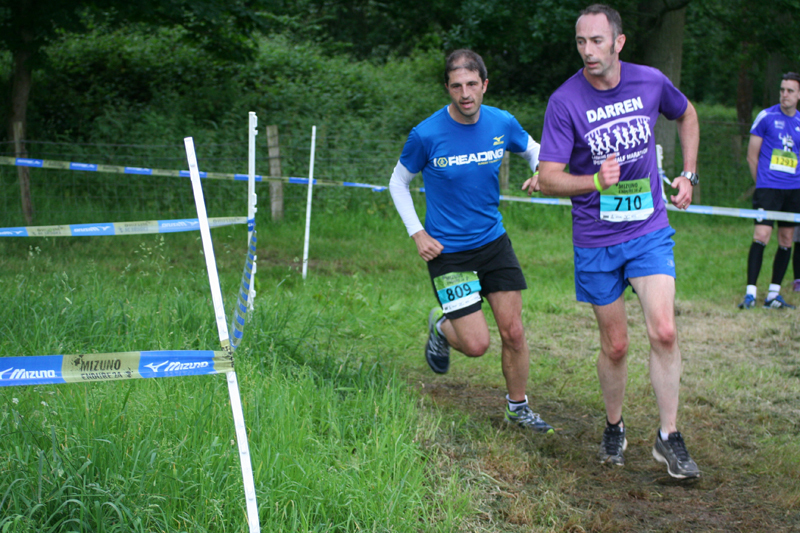 Last year we managed to cover 36 laps in the mud and finished runners up. If we all ran well, I knew would could be competitive and I was hopeful of a podium spot but it’s a bit of an unknown quantity with 78 other teams in the same category. We setup camp the night before with Jim and Michael securing a spot for us before returning home for a good night’s sleep and returning the next day. Amy had travelled down from Halifax the day before and was camping over. Amy had brought her husband Dave and her Mum and Dad who were brilliant company over the weekend and were up and awake over the whole 24 hour period supporting the team. Paul R decided to travel down on the morning of the race. Team tactics were fairly simple, we would each take it in turns to run a single lap before handing over to the next person and we would follow the same sequence for the 24 hour period. This gave us between 2 ¼ – 2 ½ hours break between laps. We had debated whether to pull a double lap over night to give people a chance to get a few hours sleep but there were mixed views on the benefit of a sleep vs. the loss of time on a slow second lap and ultimately we didn’t do this. 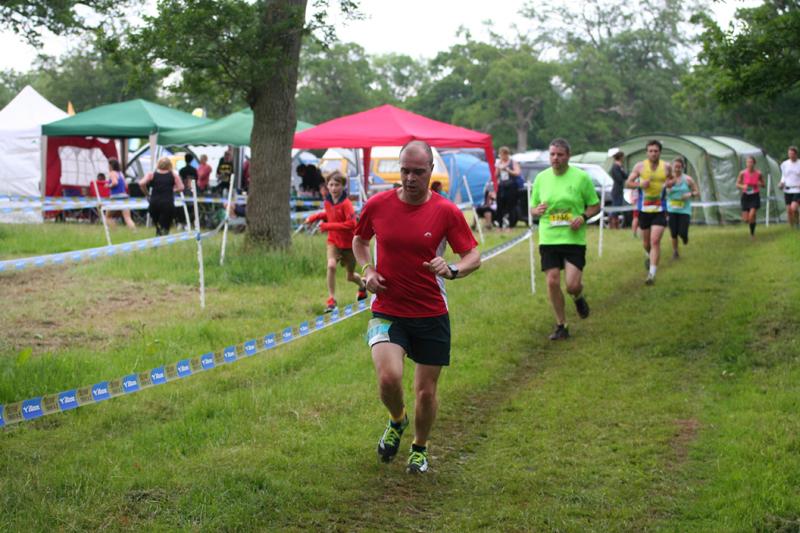 Paul Radford was our first runner and set off with the advice to be nearer the front than the back as there were lots of solo runners and no sense in having to weave around them on Lap 1. Paul put in a storming 32 min something first lap and handed over to Amy who put in a rapid 34 min lap which put us into the lead in our category straight away. I was third up and went down to the start area which had been altered this year with an enclosed area for the runners to hand over the baton (a rubber wristband). I think it was a good idea to keep people off the course as there was a lot of encroachment in the start/finish zone last year. However, the start/finish area was still pretty busy and perhaps a longer transition zone with some more room would be an improvement. Having said that people were pretty good in moving out of the way if a runner came through so there were no major issues and there was some good banter and chat in the handover zone. Running hard 5 mile laps is probably the opposite end of the spectrum to my normal running and I thought it would be wise to try and pace myself around the course. It was a bit of learning experience on your first lap or two when to push and when to ease off around the course and I got into the ebb and flow of a short distance race on each lap. Amy handed over to me and I was off along the start/finish straight taking the left hand turn onto the tarmac path through the gate to the first hill. After another depression and raise there was a nice easy downhill section which turned to the left which was a good point to push before coming to a gradual rise and then you’re into Mile 2. Miles 2 to 3 was a good mile to push. I recall a tight right hand and a bit of a rise somewhere, passing ‘Al’s Bar’ at mile 3 and a nice long chalk section. The sting in the tail was the Hill about 3.5 miles in but as soon as you had got to the top it was plain sailing with the path curving round, through a forested section (with fairy lights on several trees to illuminate the way at night) and then heading downhill with another long straight section where you could lengthen your stride before the final mile with a few twists and turns in a forested area before you entered the campsite area. This stretch was shorter than previous years and had a couple of switchbacks before a dash to the start/finish area. The course had been altered from previous events and I thought it was a lot better and stood up to Friday’s wet weather a lot better than last year’s course. There were a couple of points where you had to pay attention to uneven ground or a tree route and a couple of points where the route narrowed (the tree trunk bit) but overall I really enjoyed the trail route. I was pretty happy with a 33.33 first lap (beating my fastest lap last year by 90 seconds) although the course changes and good conditions were partly a factor and handed over to Jim and then to Michael who both put in 34-35 minute laps before back to Paul R who was out again as our first runner. Essentially, we followed the same sequence for the next 24 hours! We ran our lap, headed back to camp, had some food and drink, tried to doze (unsuccessfully) at night and then it was time to run again. Our team goal was to ensure we matched last year’s effort of 36 laps which would mean everyone averaging at least 8m/m for their laps for the entire 24 hours. The better ground conditions this year and strong running meant we were always ahead of schedule with closer to 35m laps to start dropping towards the late 30 something minutes during the night. I had the occasional look at the leader board but didn’t overly worry about it as it wouldn’t change our tactics or effort until late the next morning. However, it appears we led from the off and gradually build up a few minutes lead from the Purbeck Dawn team initially (which my buddy Matt Coggins was a member of) and then at some point during the night we gained a lap lead and then a second lap and barring a disaster we had enough of a lead to coast our last legs each. I’ve bullet pointed a few odd thoughts and moments from the event which took place. · Waiting for Amy to hand over and another runner came in looking for their partner and shouting “Adrian…. Adrian… Adriiaaaannnn”. I couldn’t help but shout “Roooccckkkyyy!” back. (although I heard the “Alice… Alice…” shout was even better). 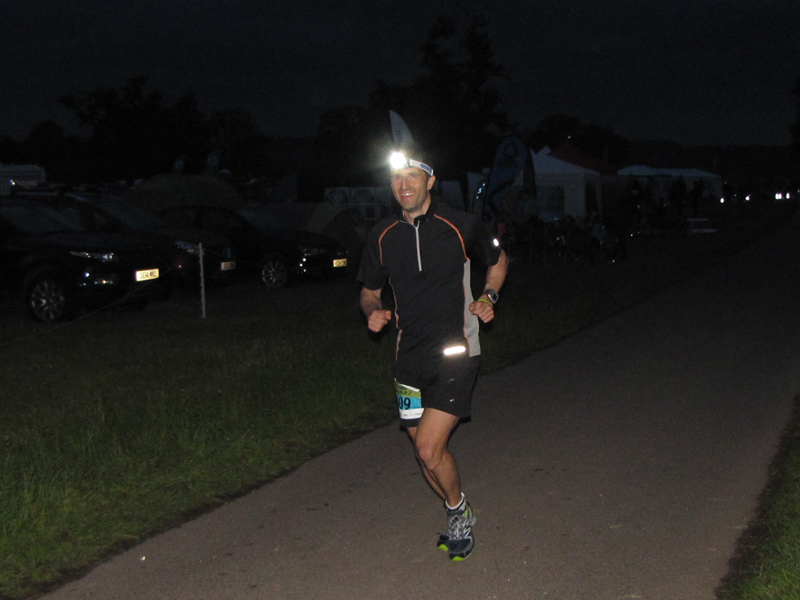 · There were quite a few people who wouldn’t consider themselves regular “ultra” runners who were attempting to complete this solo which was brilliant to see. 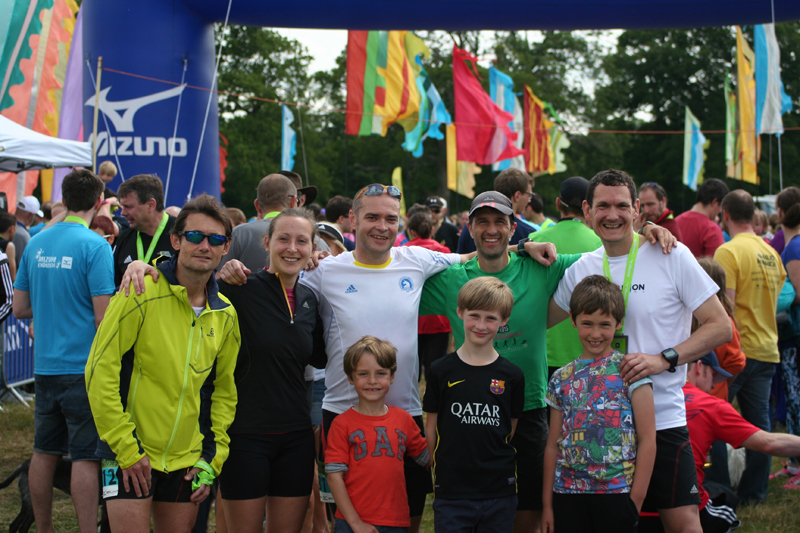 · There was a real mix of people and teams with a wide range of ages (and probably fitness and experience) which was again fantastic to see. There was definitely more of a “social” vibe this year. · It was pretty sticky and humid over the weekend. I finished every lap feeling pretty spent and with that full head sweat thing going on. My t-shirt and head torch band was completely soaked, so multiple changes of clothes was useful. 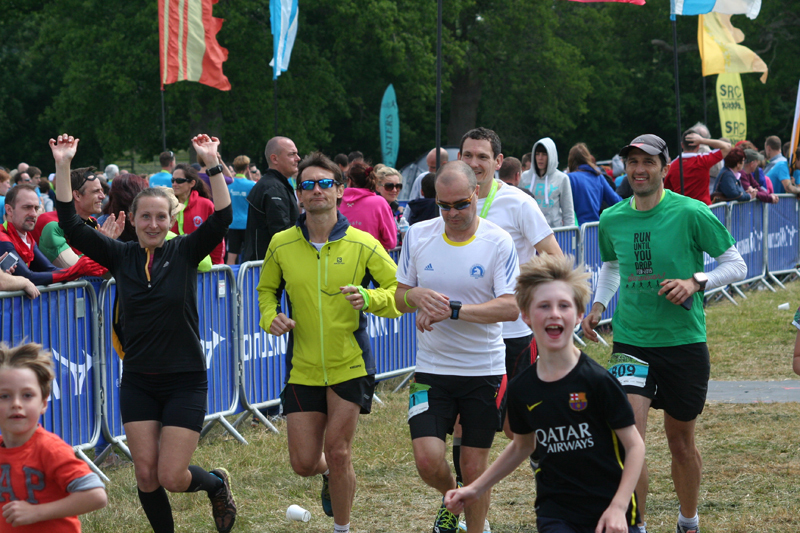 · Great to see lots of people and teams I knew at the event or out on the course. It made it a very friendly event. People were pretty friendly out on the course aswell with a quick word, hello or a well done. · I found myself needing to use the toilets quite frequently (almost before each lap). Trying to run quickly must help with the er… movement downstairs. · The Reading Joggers seemed to be having fun with a mix of competitive runners, fancy dress outfits and quite a few people attempting to complete the event solo. Special mention to Peter White who complete 50 miles solo during the weekend at the grand old age of 85. Surely, the eldest competitor to date? · Our team bonded really well and worked fantastically well as a team. Everyone was at the handover point on time, no time was lost, everyone pushed as hard as they could and gave a fantastic level of effort and despite Michael needing a bit of cajoling (several times) we all managed to complete 8 laps each. · My first 3 laps were in the light, I had 3 dark/semi-dark laps and then 2 further ones in the light. It’s nice to get the first lap out of the way, I was really enjoying laps 2 and 3 when I still had a bit of speed in the legs (relatively speaking) and then knew it would be a little slower when it was dark. The final two legs felt much harder, despite pushing there was little energy left in the legs at all but I still took some satisfaction from giving a good level of effort. · I enjoyed the laps more than last year by taking the first 1-2 miles slightly easier and then working out the places to push and places to ease off. Treating the laps as a ‘progression’ run worked quite well as you could push towards the end rather than go out hard and have that horrible ‘hanging on’ feeling. · I am slightly ashamed to say ‘the hill’ got the better of me on the last few laps. I tried to convince myself that I was marching up this just as quickly as I would have run it and I made a deal to run mile 2-3 quickly to make up for any lost time but well… that’s just excuses. · Our supporters (Amy’s family and Katrina and the kids) were great and spent lots of time out on the course cheering the team and others. · I was really happy with my own personal effort. Last year I did 7 laps and averaged 39.49 per lap (7.58 m/m per lap). Ground conditions were much better this year which helped but I thought I was still slightly quicker covering 8 laps and averaging 36.29 per lap. An average of 7.18m/m for 40 miles on a trail route with a bit of up and down and with 3 dark legs was pretty good for me. · The team were ace. Michael, Jim and I are all fairly similar runners with current fitness levels being the only differentiator at the moment so I knew what sort of times we would run. Our newcomers to the team Paul R and Amy are both really strong runners and definitely helped push the team’s results up a step. With a few hours to go, we could afford to coast our last laps knowing the work had been done and we even managed to get 40 laps done so every member ran 8 laps (despite Michaels reluctance!). We enjoyed the traditional team finish, running in together as a team and were delighted to eventually finish 1st in our category (3-5 mixed teams) out of 79 teams. A very rare win to report! 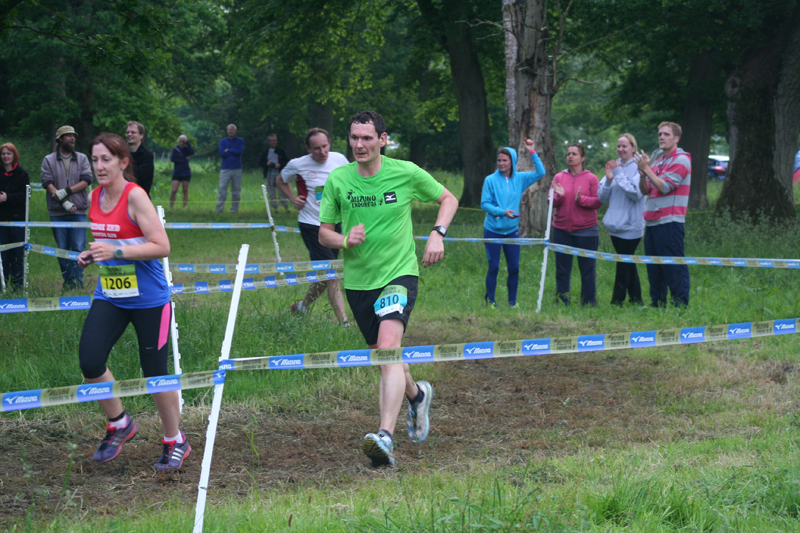 Thank you to Chris, Claire and team (including all the marshalls and helpers) for putting on another great event. I hope the other runners and teams enjoyed the event. Fourth pic in is my hubby. Congratulations guys, it was an amazing event!